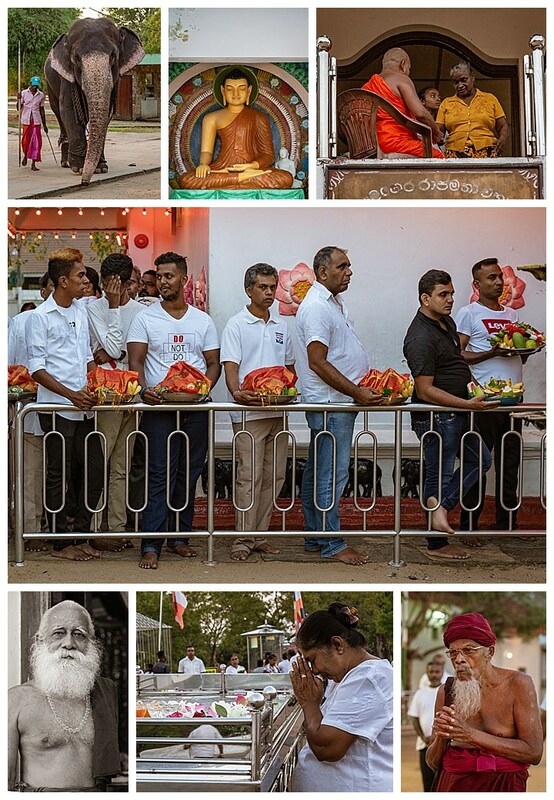 We passed briefly through Nuwara Elija, stopping first at a Buddhist temple, where we watched a priest bless offerings of the worshippers (center). 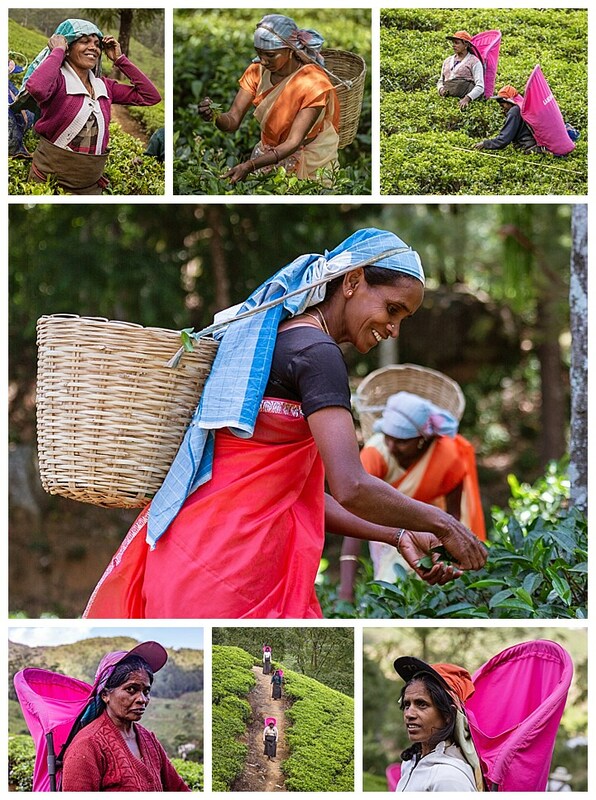 A stop at two tea plantations gave us a chance to see premium Sri Lankan tea being harvested. Our most interesting stop of the day was at a tiny village, for a rest stop. The children were home from school, and flocked out to greet us. Many were wearing white cotton gloves (top row). Due to the language barrier, we were never able to discover why they wore them, but it appeared to be nothing more than a fashion accessory that they enjoyed showing off. 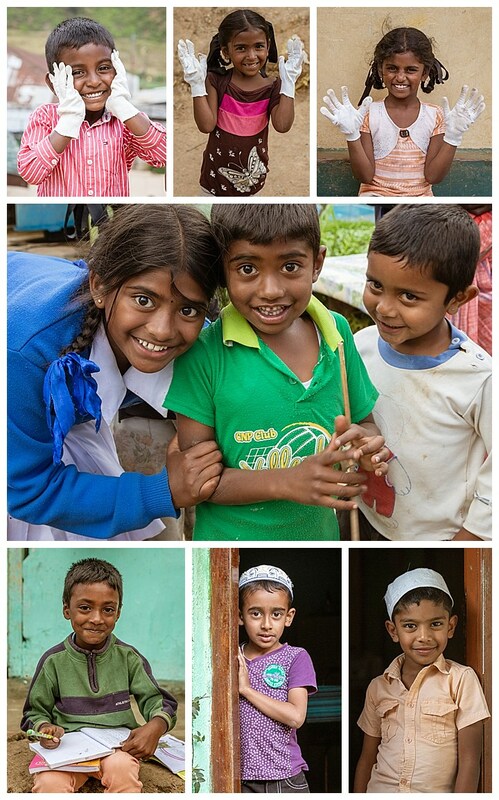 The adults in this village were just as welcoming as the children, with many willing to pose for us in front of their homes. 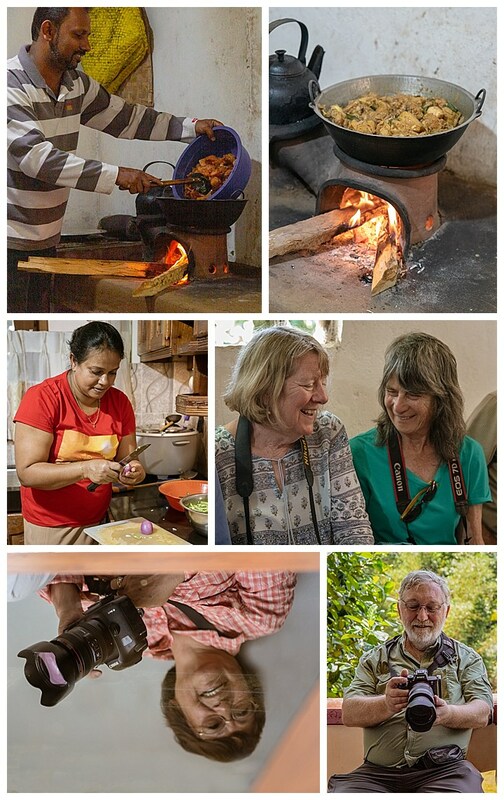 One woman invited the group to her home, and Mehmet (our tour leader) got her contact information, so that he can visit this same village on his future tours here. 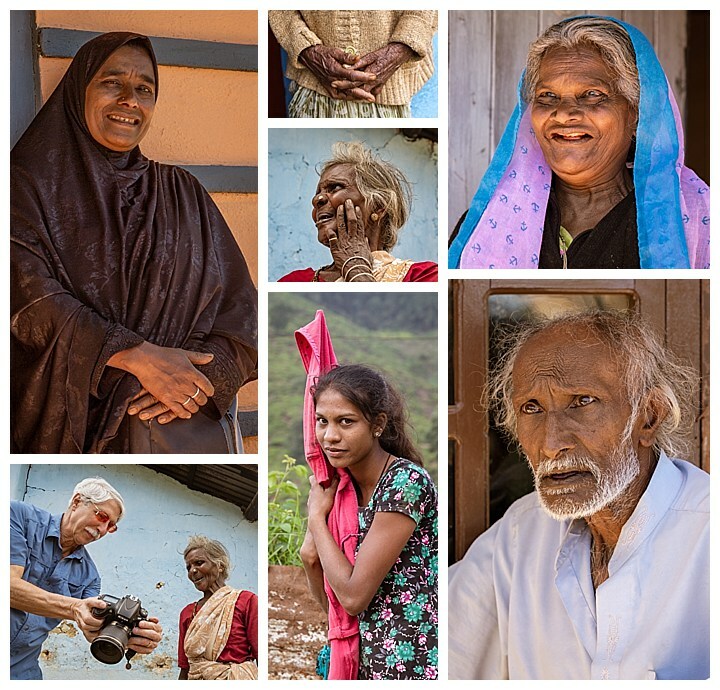 Rich is seen showing a photo to one of the villager women, bottom-left. 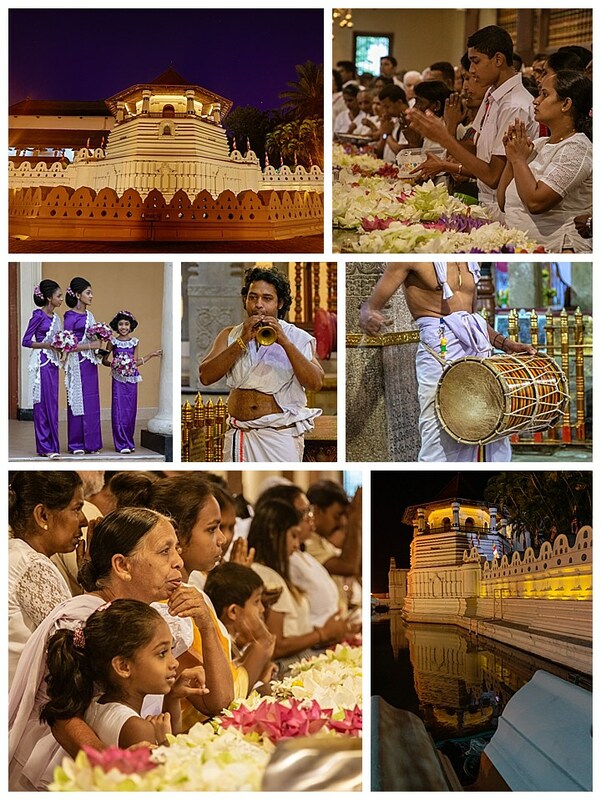 We returned to the Temple of the Sacred Tooth Relic before dawn to capture the blue hour, and the colors of the temple just as the sun was rising (upper-left and lower-right). 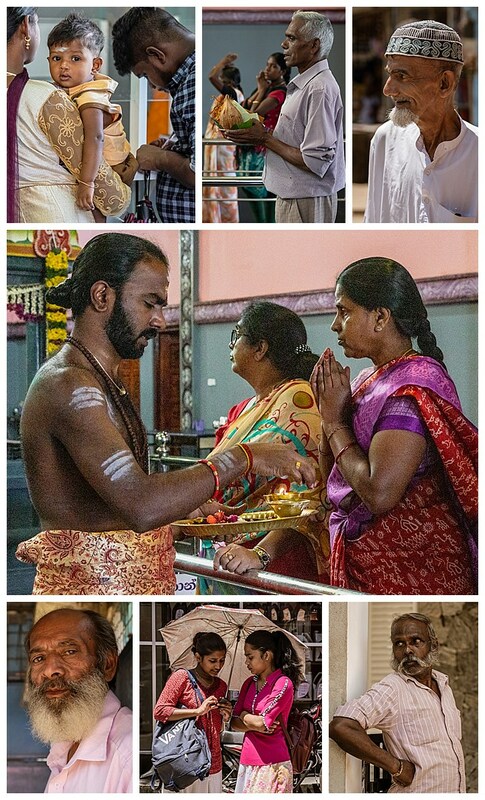 We then entered the temple to photograph the morning prayer ceremony. As we were leaving, we noticed some women dressed to welcome a wedding couple (middle-left). 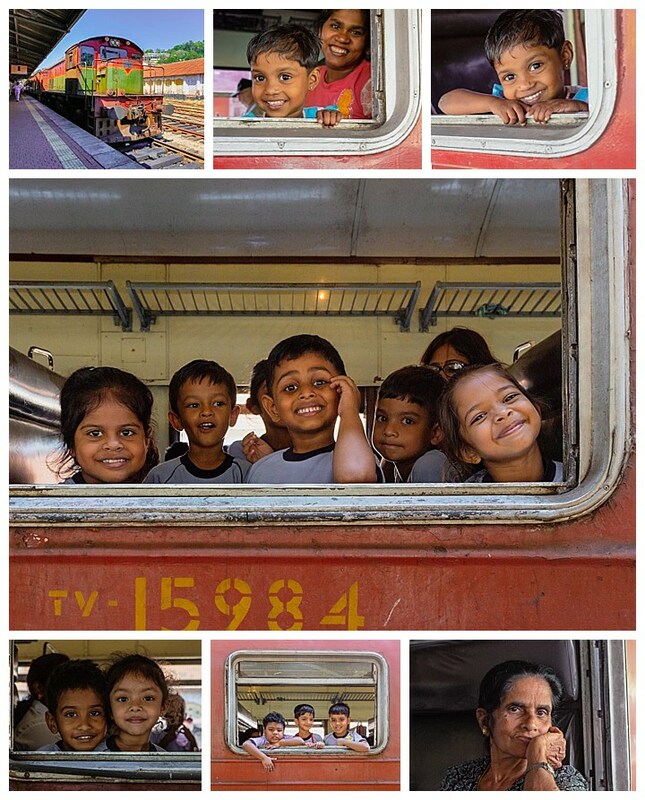 After breakfast, we went to the Kandy Railway Station with colorful antiquated cars. There were plenty of photo opportunities with people looking out of the windows, for the cooler air while waiting for their train to depart. 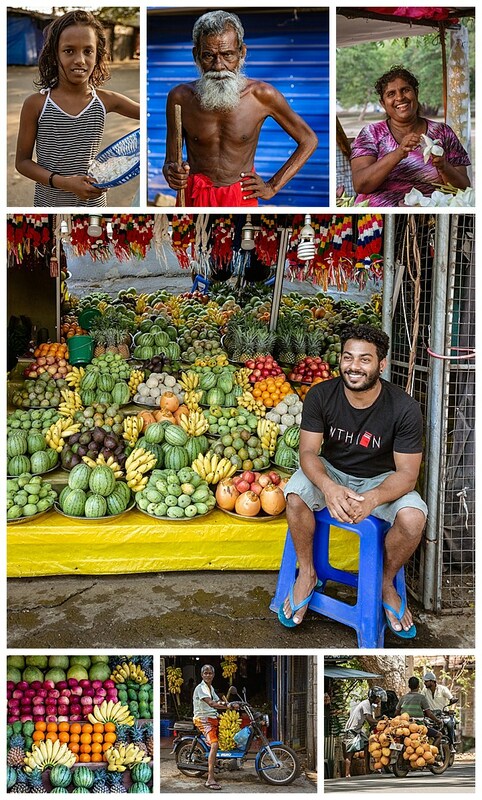 A few blocks from the train station was a typical Sri Lankan market. 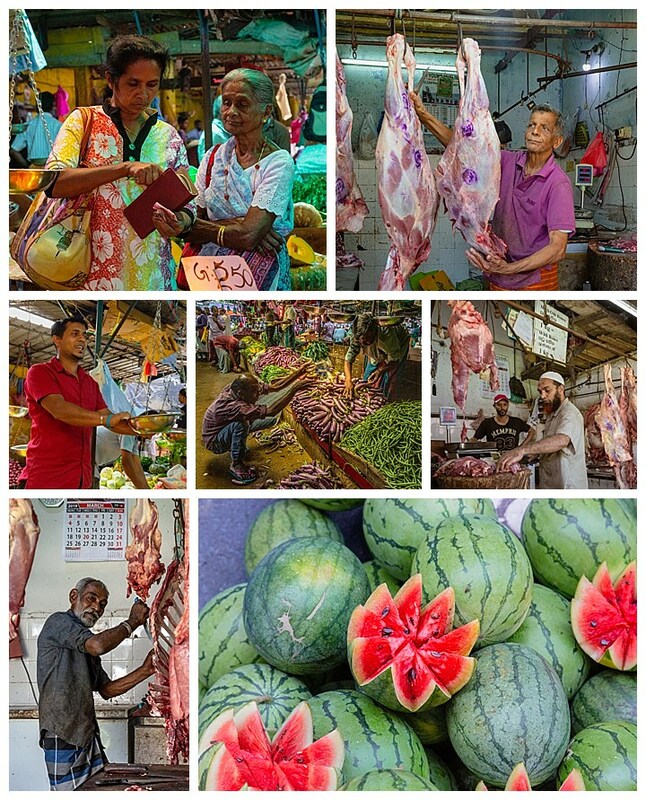 We love to explore these, for the variety of colors, exotic foods, and for scenes of people going about their daily routine of preparing and buying their food for home. The butchers were particularly interesting, and you could definitely smell the unrefrigerated meats. 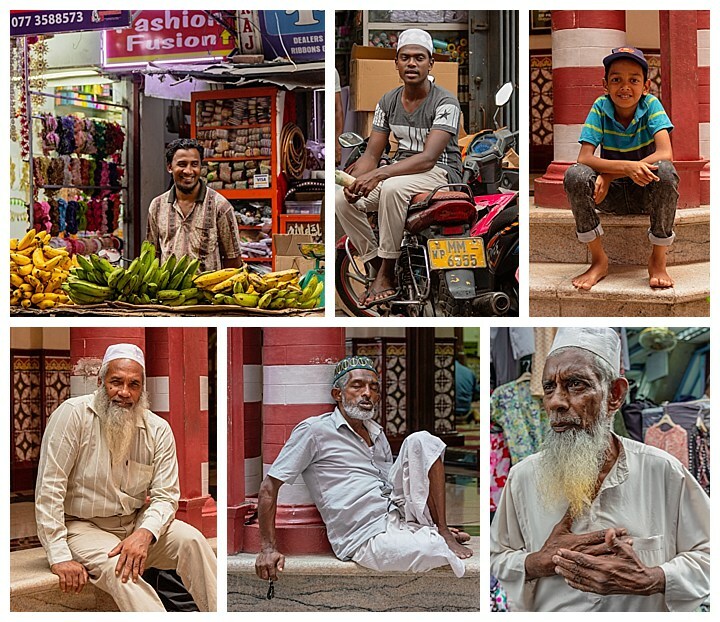 A unique aspect of this market was that most of the vendors were men. 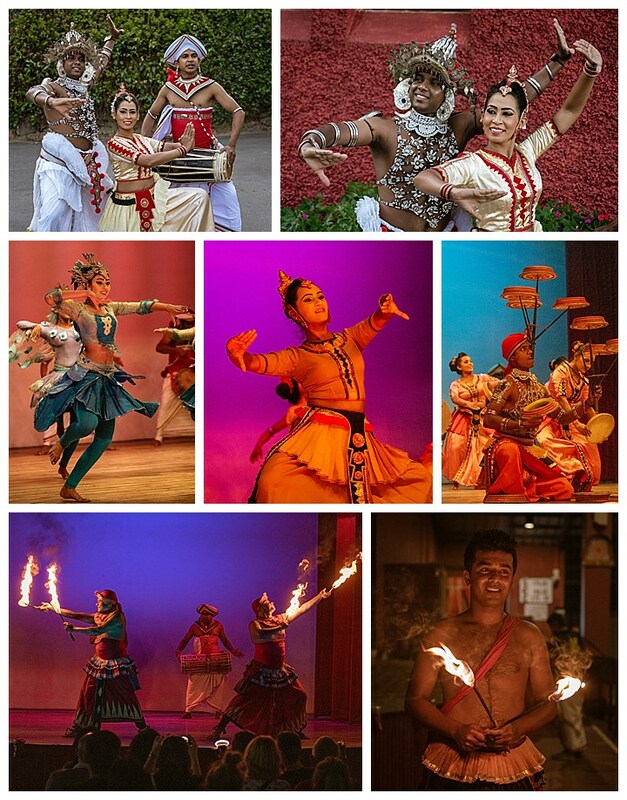 We finished our stay in Kandy with a traditional cultural dance performance at the Kandy Lake Club. The show is visually quite stimulating and the costumes were beautiful. Prior to the show, three of the performers posed for us (upper row). The dance show was rather enjoyable, with some fire dances (bottom row), and ended with the performers walking over hot coals. 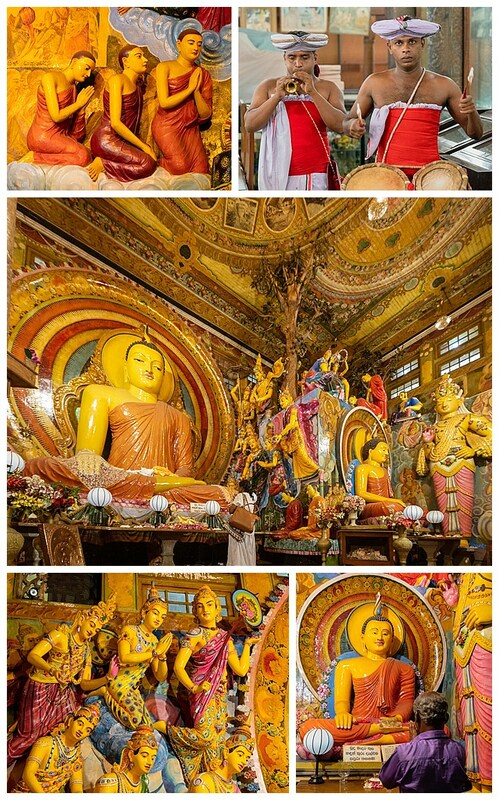 We started today with a stop at the golden temple of Dambulla. Throughout Sri Lanka are huge statues of Buddha, but this is easily one of the largest, as seen above. To the right, there appears to be a long line of monks walking in a line to give offerings to Buddha. Upon closer inspection though, you can see that they are actually well worn statues themselves (bottom-middle). The black spots under the Buddha’s chin are wasps nests (top and bottom-left). 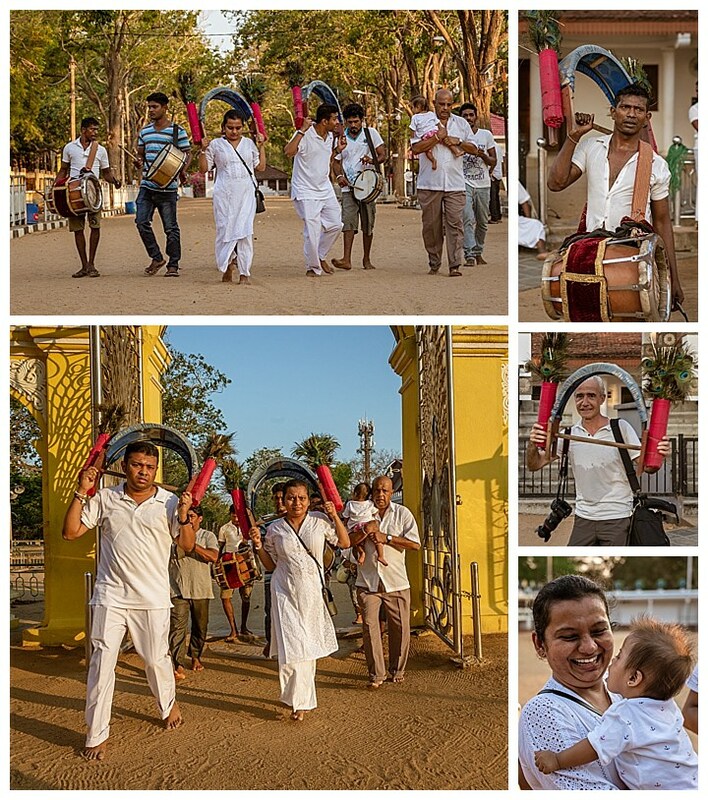 We then toured the nearby cave temples of Dambulla, a UNESCO World Heritage Site. The site comprises of 5 caves, each with ornate statues, and well worth the 300-steps climb to the top. 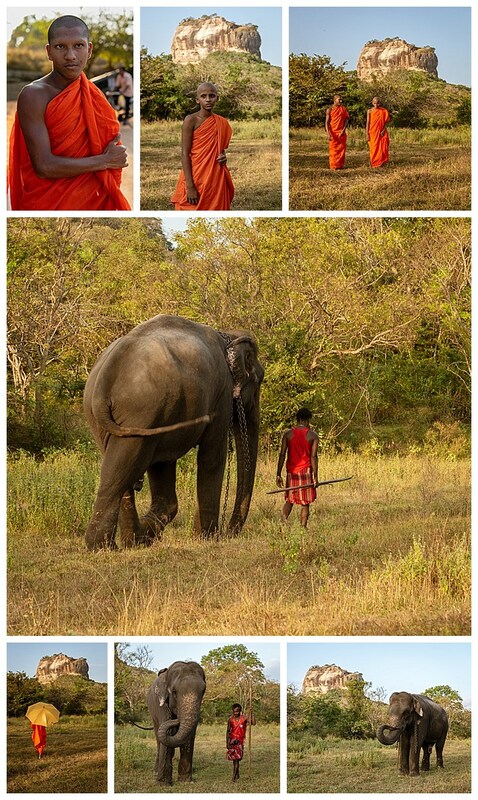 Dambulla is the largest and best-preserved cave temple complex in Sri Lanka. The rock towers 160 m over the surrounding plains. There are more than 80 documented caves in the surrounding area, though five compose the most famous, as shown above. 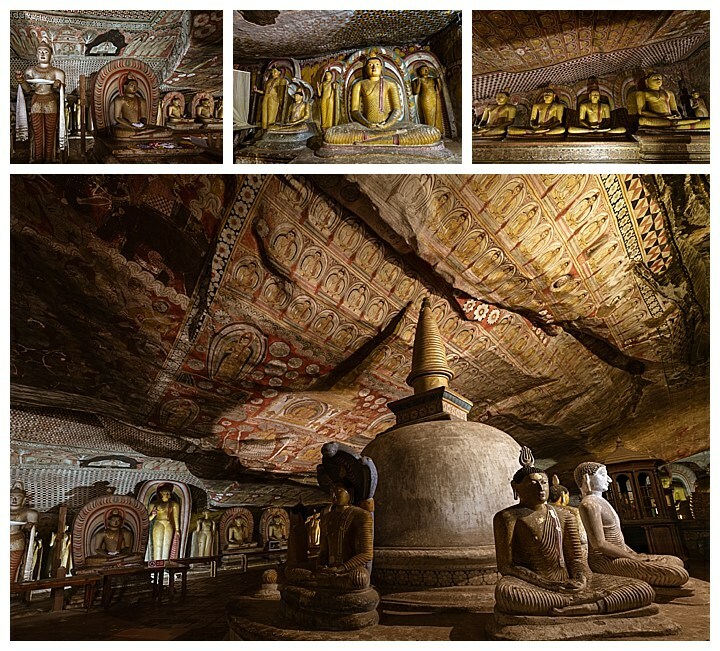 These caves date back to the first century BC, with a total of 153 Buddha statues and 23,000 sq ft of murals. 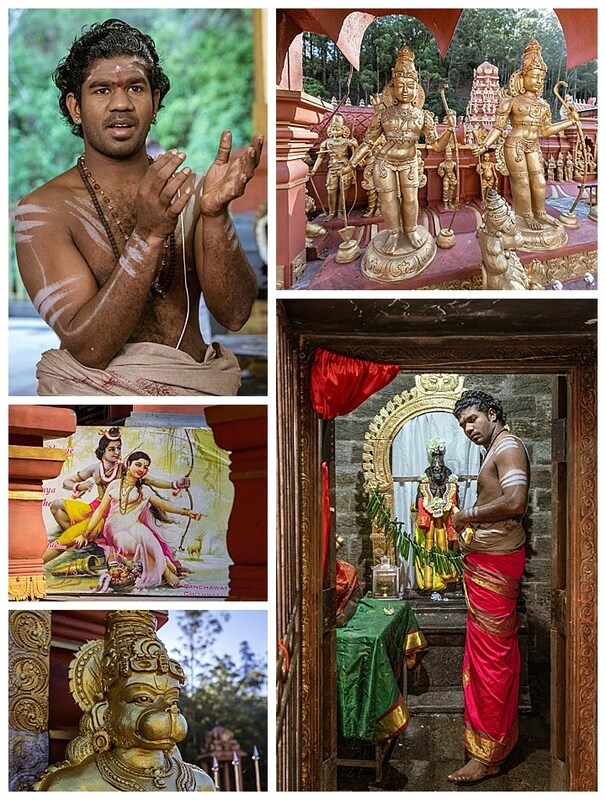 While driving to our next destination of Kandy, we stopped at another Hindu temple. 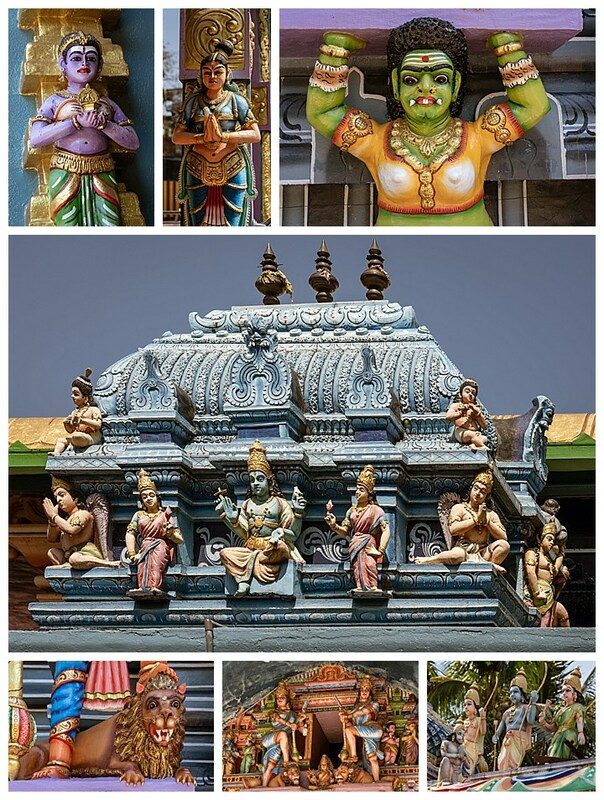 These are always ornately decorated with colorful renditions of the many gods of this religion. 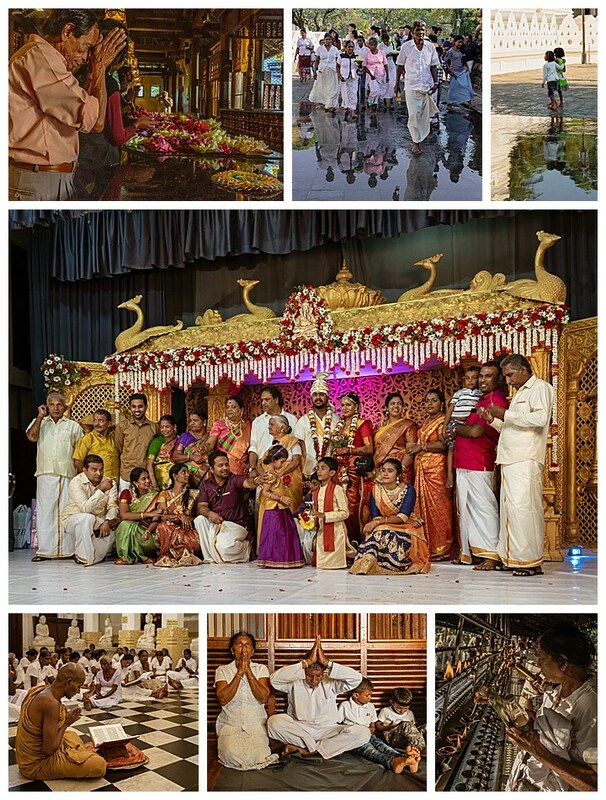 We happened upon a Sri Lankan wedding as it was concluding, and were able to see the couple’s family gathered for their group photo session (middle). The father of the groom was a friend of our local guide, and he gave us permission to take photos. We finished in Kandy at the sacred Temple of the Sacred Relic Tooth of Buddha, another World Heritage Site. The golden-roofed temple houses Sri Lanka’s most important Buddhist relic, a tooth of the Buddha which is housed in a gold casket. We were able to photograph people worshipping here, including a monk leading a prayer chant (lower-left). Throughout Sri Lanka, and Thailand before, we found that people seemed to have no problem with our cameras being present during worship. We drove most of yesterday, enroute to Habarana. 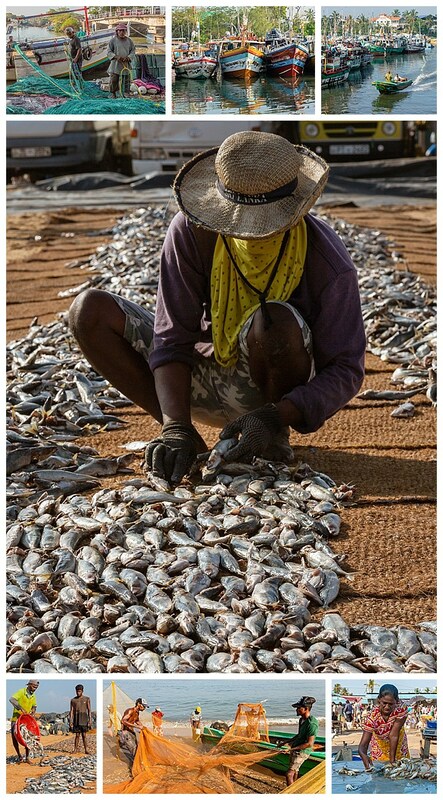 Our first stop was the fishing town of Negomo, where they dry fish on the beach. We spent a couple hours watching the colorful fishing boats (top row), the men hauling in the catch and dumping it on bamboo carpets (bottom-left), and the workers organizing them to dry (center). 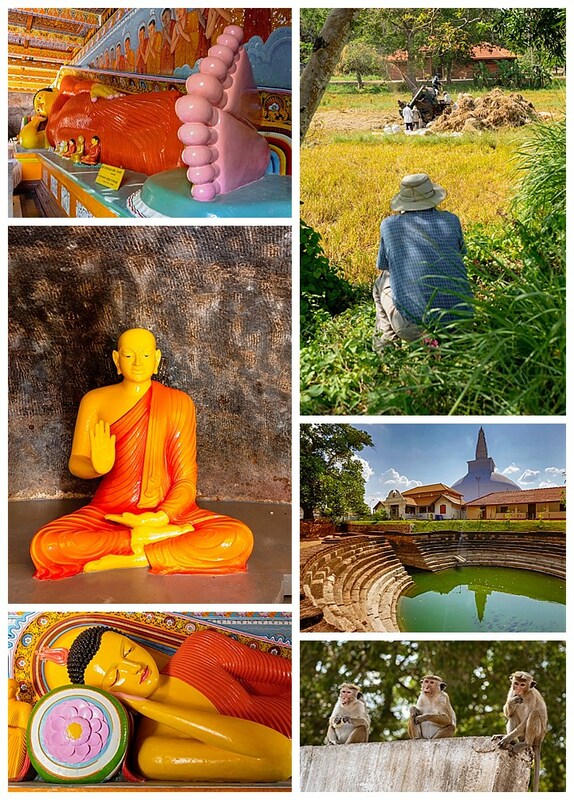 After lunch, we continued on to Anuradhapura, where we photographed the Isurumuniya Temple. 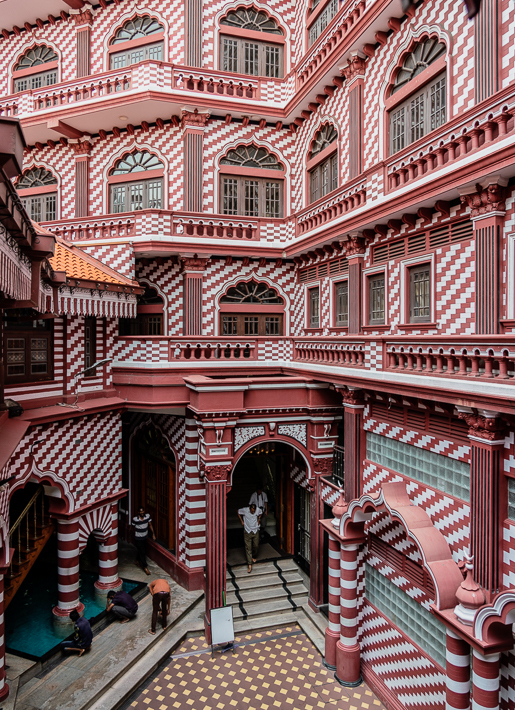 King Ravana was born here, and its written history goes back over 5000 years. 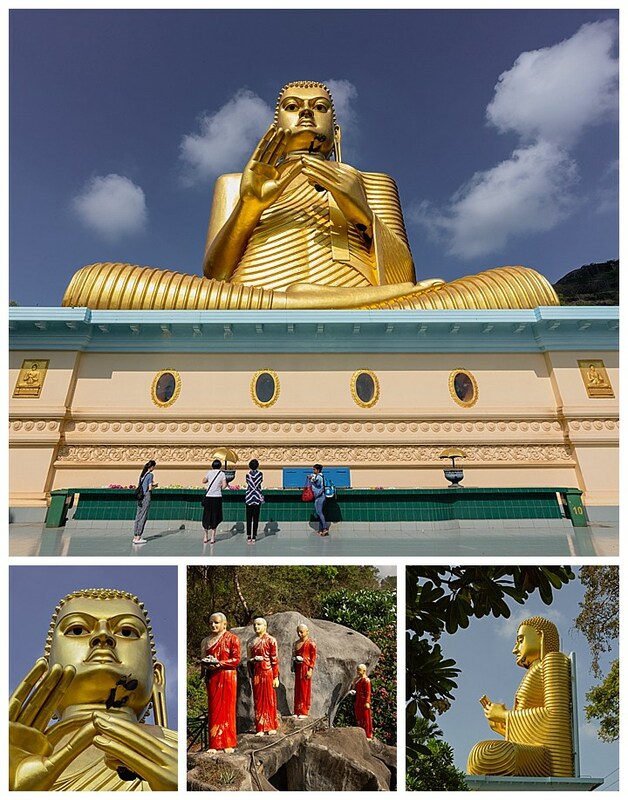 Today though, it is most known as having the most colorful reclining Buddha in the world (left column). 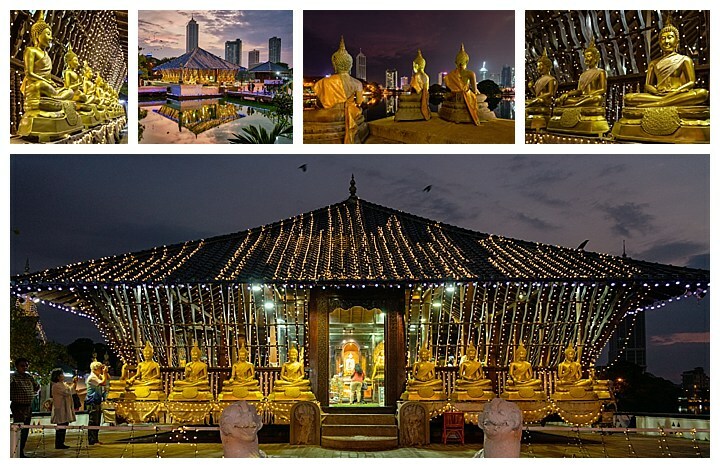 At the same historic site was the Ruwanwelisaya Dagoda, with a photogenic circular pool in front of it (middle-right). Enroute, we saw a rice harvest machine working in a field, so stopped and spent a few minutes capturing it (mostly shot video of it in operation, though upper-right shows Martin, from our group, also photographing the work). At the end of the first day, we drove to the Sigiriya Rock, which is a huge rock used as the Royal Palace briefly in the 5th Century BC. 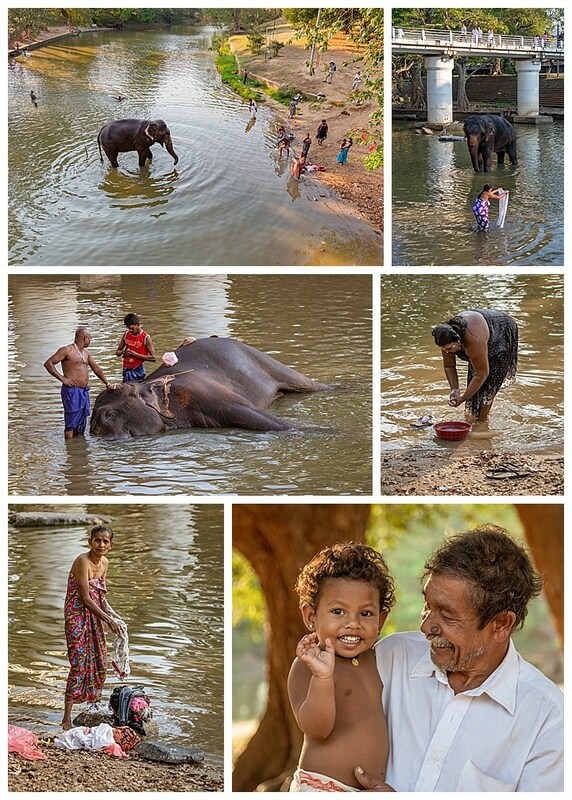 It is now a UNESCO World Heritage Site, and was used as the backdrop for a photo session with an elephant, his handler, and a couple of monks, as seen above. Yep, Mehmet hired 2 monks and an elephant, so we could have a foreground. 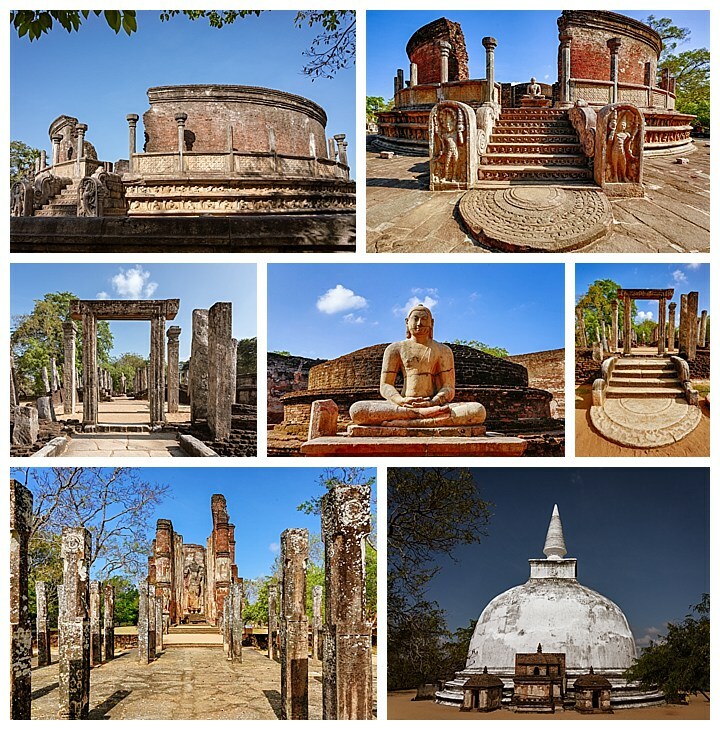 The next morning, we drove to Polonnaruwa, a historic site of ancient Buddhist temples. 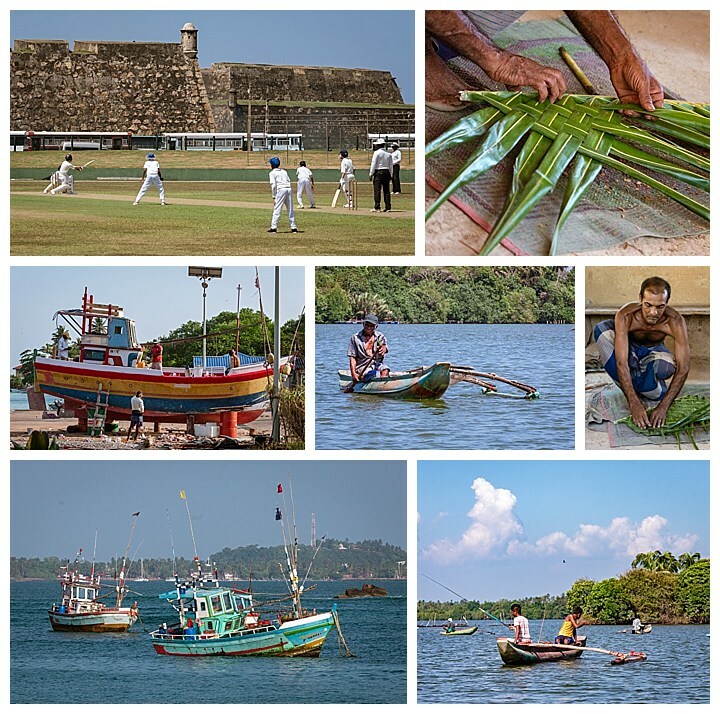 It seems that the capital of this island (Ceylon when we were in school, and now Sri Lanka) has had many names and many capitals along the way. This was the capital of during the 10th Century AD, named Nigaril Valanadu at the time. While we were there, two bus loads of Thai monks arrived. 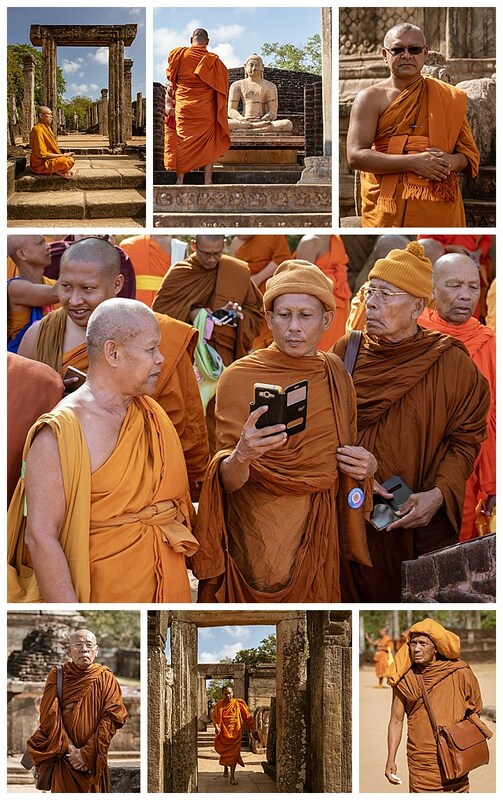 They were religious tourists, studying their Buddhist history, but taking selfies and snapshots of each other like any other group of tourists you will find anywhere in the world. We find Buddhist monks to not only be colorful and fascinating to photograph, but also extremely polite and tolerant of our cameras. 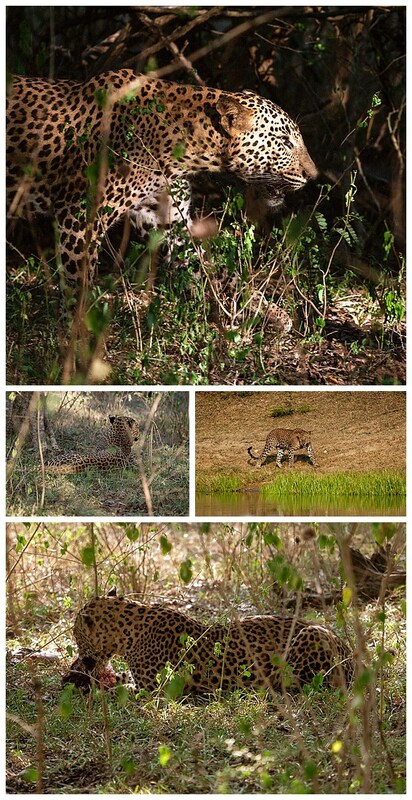 We completed our time in Habarana with our first game drive in Sri Lanka. 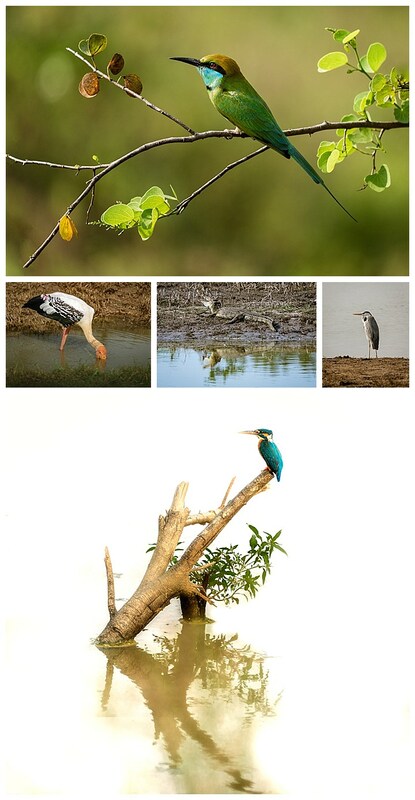 For this drive, we went to Minneriya National Park. 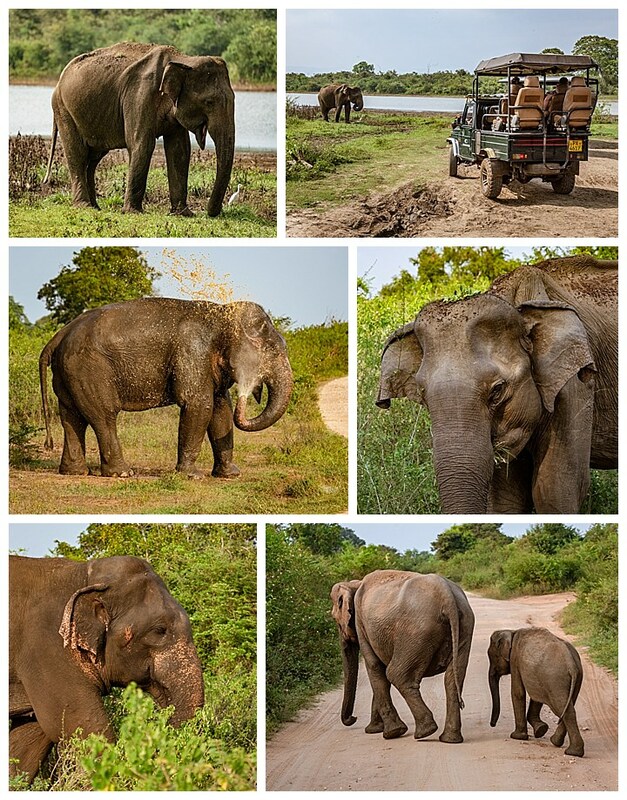 Sri Lanka is mostly famed for its elephants, and this park was a good introduction to them. 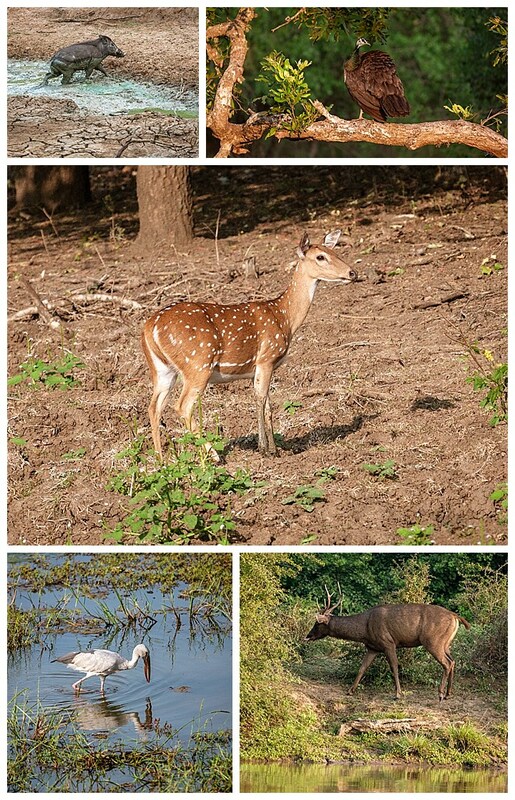 With only a couple of exceptions (like the monkey upper-left and the egret upper-middle), elephants were the only wildlife in this park. Unfortunately, it was also overrun with jeeps full of tourists. 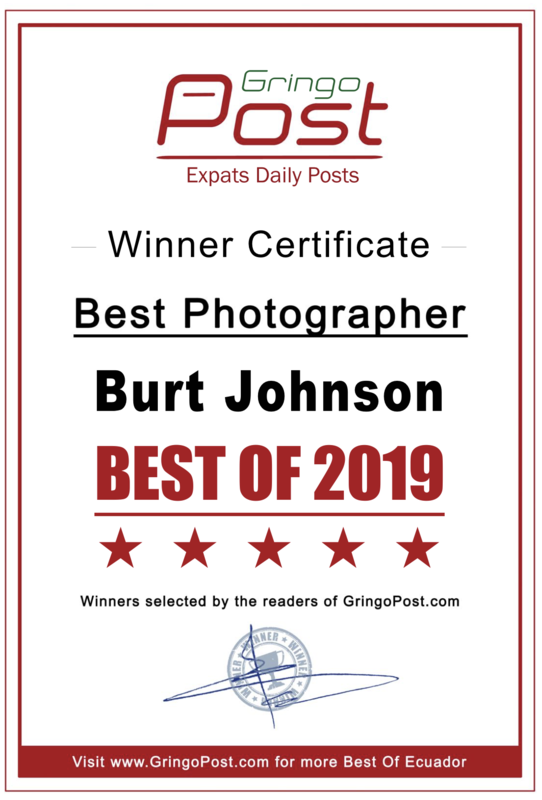 Yes, I know we are also tourists, but we are more accustomed to going places mostly devoid of others using their cameras as a hunting tool! 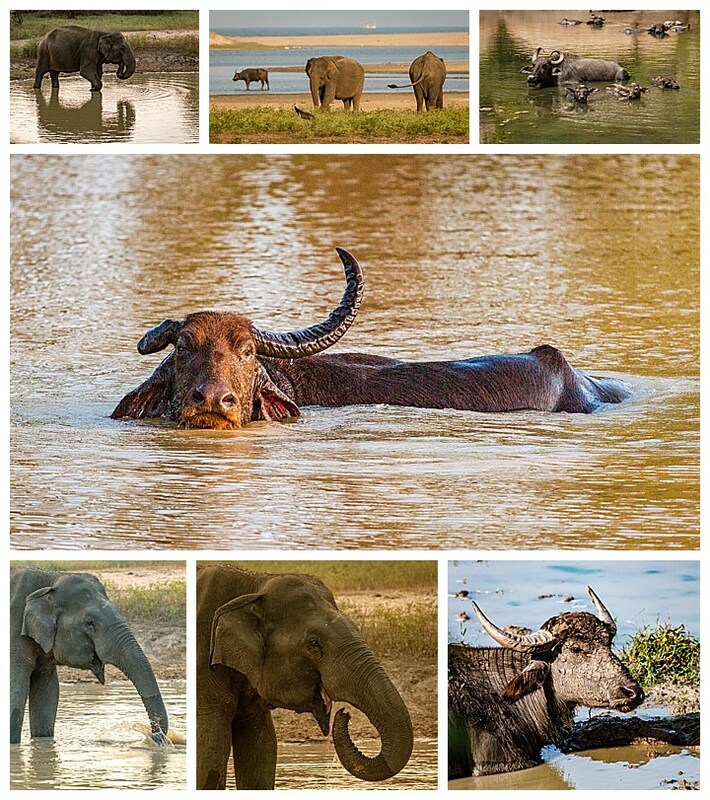 Prior safaris to Tanzania (1991), Zimbabwe (1993), Namibia (2018) and Botswana (2018) all involved jeep treks into forests where we almost never saw another two legged wheeled animal. The monks in a jeep (upper-right) were interesting, but then we hit… The Line… (lower-right) of some 50 jeeps, which is where we spent most of the “safari,” literally stuck in traffic, since the jeeps were not allowed by park law to more than two wide (to protect the land and reduce the road imprint). It seems a fitting end to this safari to show how we approached one elephant, with another jeep in front of us. 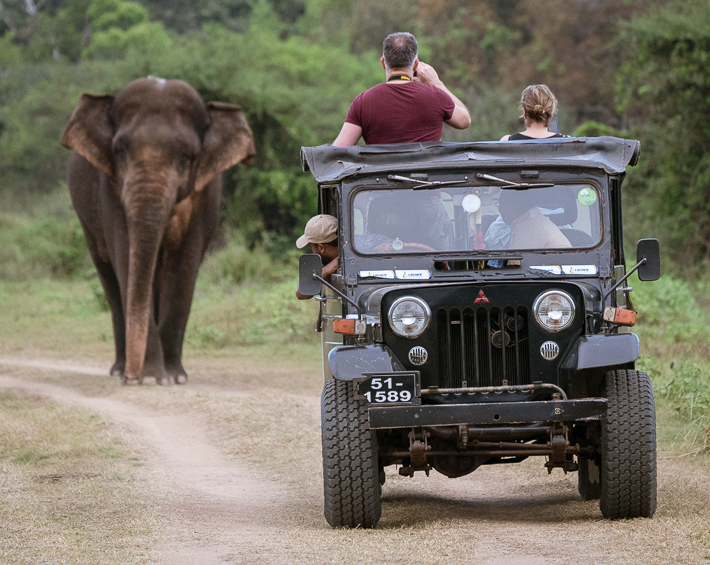 Moments after this was photographed, the other jeep left, and we got a clear shot of the elephant… and a clear scent too… From our prior safaris, we recognized the extremely pungent smell of an elephant in musth. 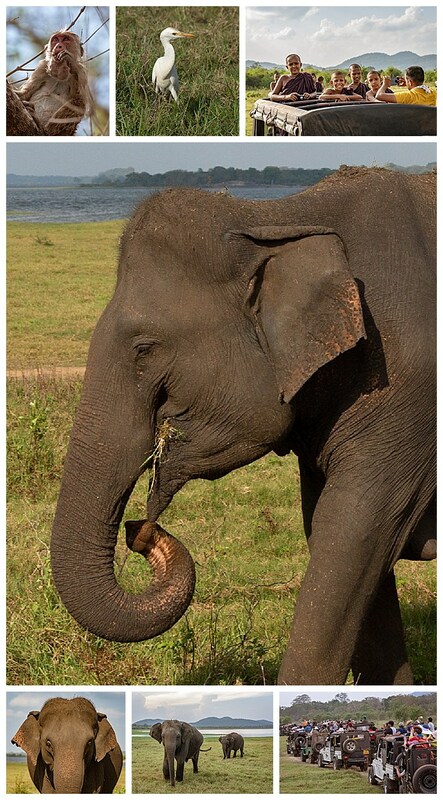 This elephant was the only one we saw with a radio GPS necklace, allowing the park rangers to track it. The elephant had killed two villagers the prior week, and was being tracked to assure it did not return to another human populated area.